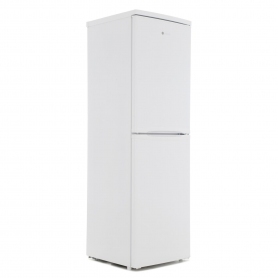 This Hoover HSC574W Static Fridge Freezer has all bases covered and still saves you money on bills. The product has an A+ energy rating, so can hold its own for efficiency and helps to cut down on energy costs, while being eco-friendly. 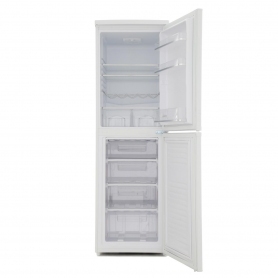 Food can be chilled and frozen on mass and in equal measures, as there's a 50-50 size split between the fridge and freezer. In either instance, there is plenty of room to spare. 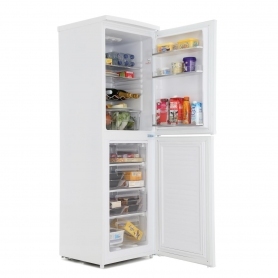 The fridge makes great use of its space with three balconies in the door alone, which can accommodate big bottles of milk, fizzy drinks and fruit juices. Further drinks can be stored in the internal wine rack, which can fit in up to five bottles and still leave shelf room below. Two half salad bins are at the bottom to keep all fruit and vegetables fresh. 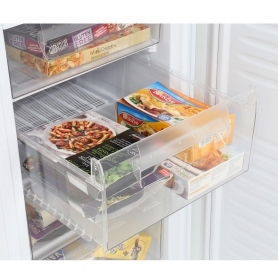 Two adjustable shelves, one of which can make up a top layer to handle large jars and lunchboxes, offer even more scope for cold food storage. The fridge benefits from LED interior lighting, which is also kind to the environment as it uses less electricity than traditional bulbs. 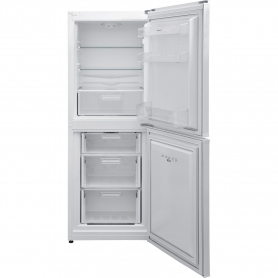 And the freezer has four see-through shelves with a deep bottom layer, handy for storing joints of meat and big tubs of ice cream. The rest of your frozen goods easily slot into the rest of the compartments so there will be no trouble fitting pizzas, pies and the like in.